Grab some popcorn, because the feud between shooty nightclub Suede and its bitter/vociferous neighbors is heating up. 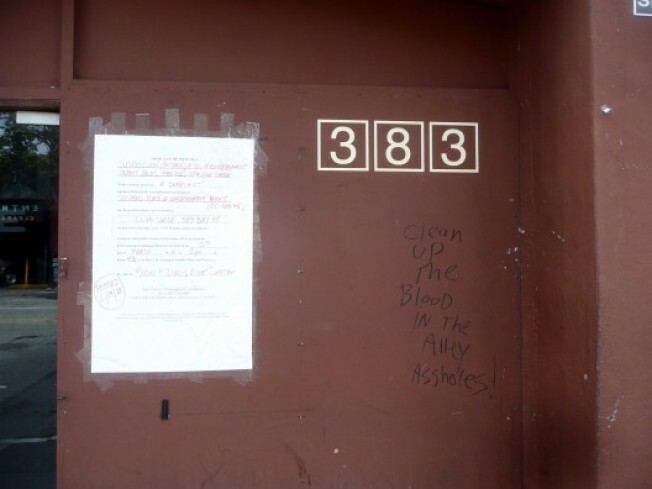 Two weeks ago, an angry North Beach resident—a NIMBY, as some have claimed—presented a letter complaining about Suede's noise, and this week, the facade of the club is rife with polite requests like "Clean up the blood in the alley assholes" and "Shut this shithole down." Such language! See, the graffiti and swearing are there because they don't want Suede to make their neighborhood look bad.